I was lucky to catch up with David RR Webber in Washington, DC and was able to talk to him about the OASIS Election Markup Language (EML). David and I also got kicked out of a bar in this episode. Musical guest Matt MacKenzie lays down some 1980's flavour house groove with a great backbeat and ambiance. Code and Tunes gets into how to set up LiveCycle ES for Java Developers plus some tips on how the OASIS EML might be implemented using Adobe LiveCycle ES2 and PDF. I had sent my wife flowers for her birthday. I logged onto the web as I was in London and found some local florists. I went with one that looked good but have since found they ripped me off. 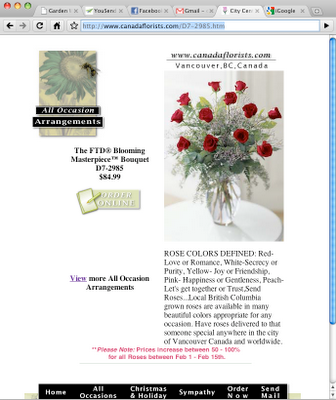 Do not use City Centre Florists (http://www.canadaflorists.com/D7-2985.htm/) as they use a very deceptive practice. Here is what happened. 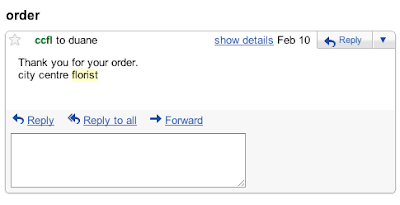 I went to the webpage to order the flowers for my wife. After finding the ones I wanted, I clicked the "Buy Online" button. See the image below. I called them to complain and they said simply that they arbitrarily decided that flowers cost more around valentine's day. They claimed that they had some text somewhere on the website saying they could cost anywhere between 50-100% higher from Feb 1-15. Note that this now appears on the website image (above). This did not appear on my browser at the time I ordered these flowers though. The check out screen said $84.99. I contacted my credit card company and am filing a dispute. In the meantime, if you send flowers to anyone in Vancouver, do not use City Centre Florists. They are deceptive, rude people who should be put out of business IMO! This dishonest business practice is also against BC law. In British Columbia you have to honor the lowest advertised price. City Centre Florists are criminals. They were given a chance to be nice and do the right thing but now this blog post stays and everyone can see what criminals they are. (iii) the supplier's estimate of the price is materially less than the price subsequently determined or demanded by the supplier unless the consumer has expressly consented to the higher price before the goods or services are supplied;"
Screw you City Centre Florists!!!! You are evil, stupid and treat your customers with contempt. I hope you go out of business and I will do everything to make this story heard until you fail.